I signed up for the free trial of Netflix and Getflix DNS and successfully tested them both on my Windows 7 laptop with no issues so the next step was to move to getting this running on Ubuntu. I have a media player, an Nvidia ION Atom box running XBMCBuntu based on 12.10 Ubuntu with 12.3 XBMC. I installed Chrome and Wine and Pipelight and booted to a desktop so I could test this out. Using the useragent to set my browser type to Firefox I can login to Netflix.com and browse the media no problems at all. When I go to play though I just get a black screen with no audio or video. Everything is updated to the latest levels, I have tried Chromium as well and get the same issue. I have tried different user agent settings as well but no luck. I didn't think it worked on any linux devices because of the lack of silverlight. Edit: Oh I assume pipelight is an aftermarket implemenation of silverlight. I doubt it would have all the security keys required by netflix. Doubt it will work from any browser directly on Ubuntu. You could however try running an android emulator in virtualbox, download the android Netflix app and see if that works. I played around with an Android emulator last year on ubuntu. But never tried running the netflix app. Another option is to install wine, and then install windows firefox and Silverlight. From what I have read people have it working but finding step by step confirmed instructions is hard. 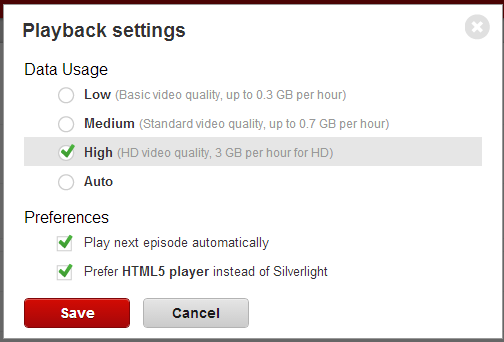 Netflix runs HTML5 as well.. Thanks very much for this, worked straight away. Any idea where the settings file is that I need to alter? as for sound that will be a wine issue maybe you are on a 64bit system?